A Beautiful Ruckus: All Clean and Cute! We took a few photos of the babies today after their baths. Hey, they don’t stay clean for long, so we thought we’d take advantage of it! 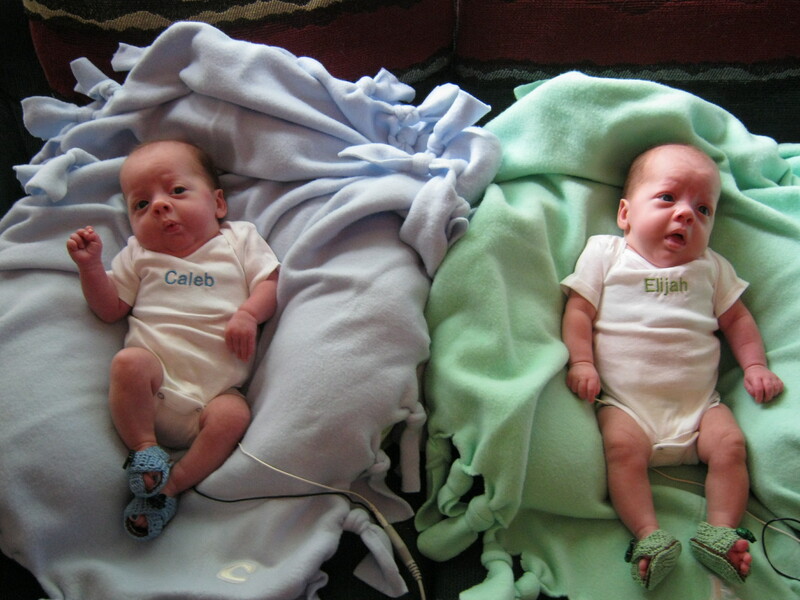 We also weighed them before their baths, and can’t believe how quickly they are growing! 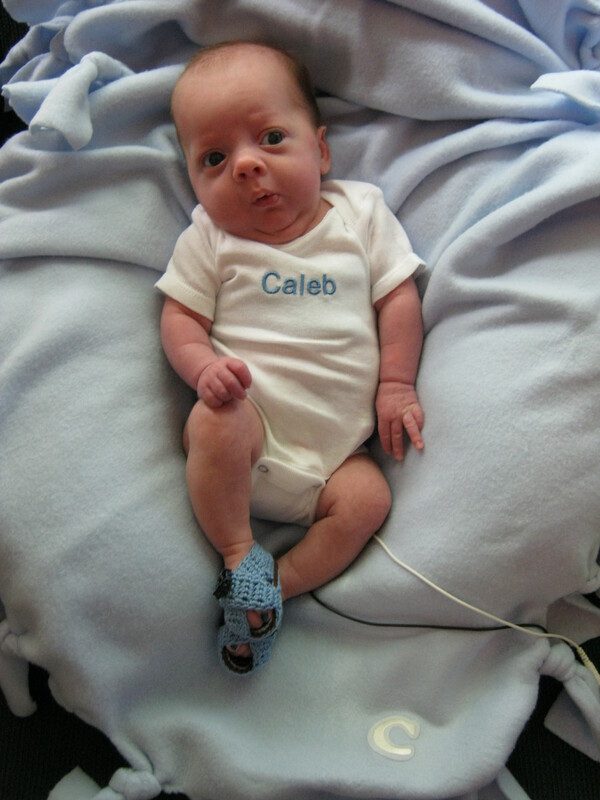 Caleb: 8 lbs. 10 ½ oz. 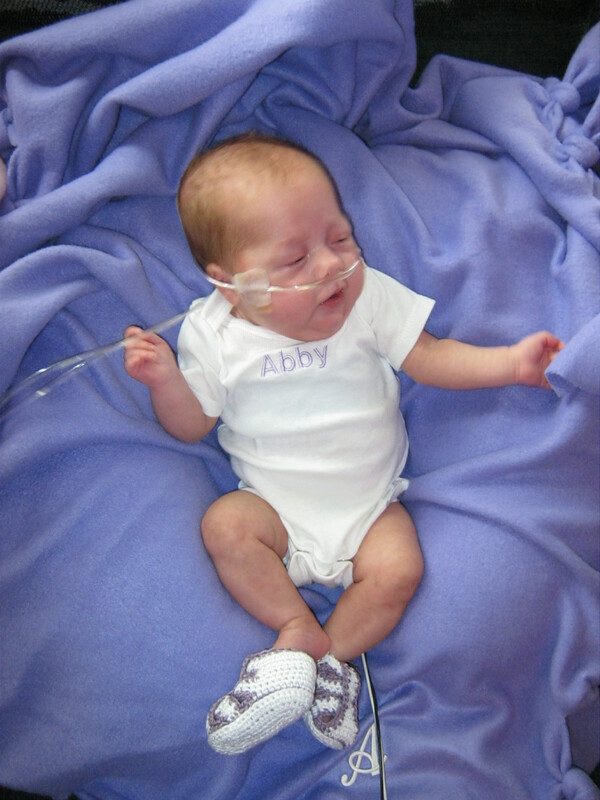 Abby: 7 lbs. 5 ½ oz. 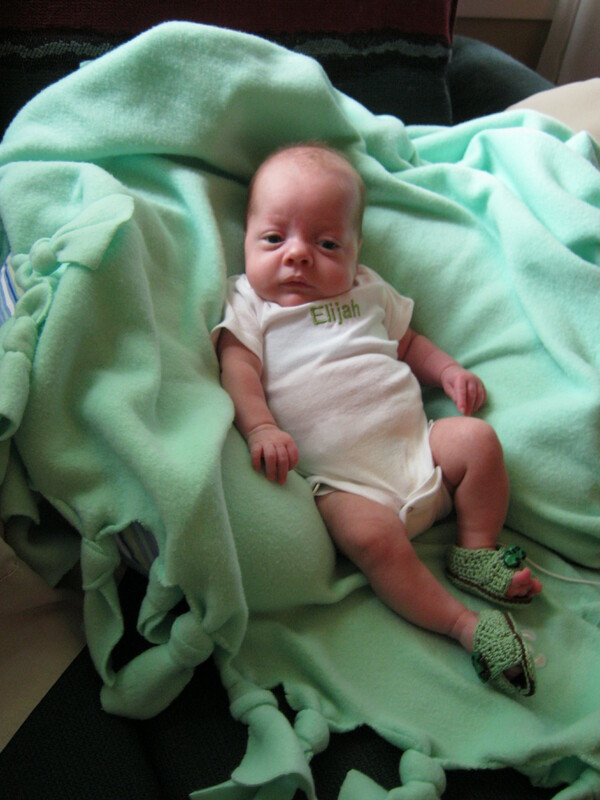 Elijah: 8 lbs. 8 ½ oz. Ellie: 6 lbs. ½ oz. The monogramed onesies were made by Judy. She was my math tutor in high school and has become a close friend since we graduated. I love that she put their names on them in their colors! 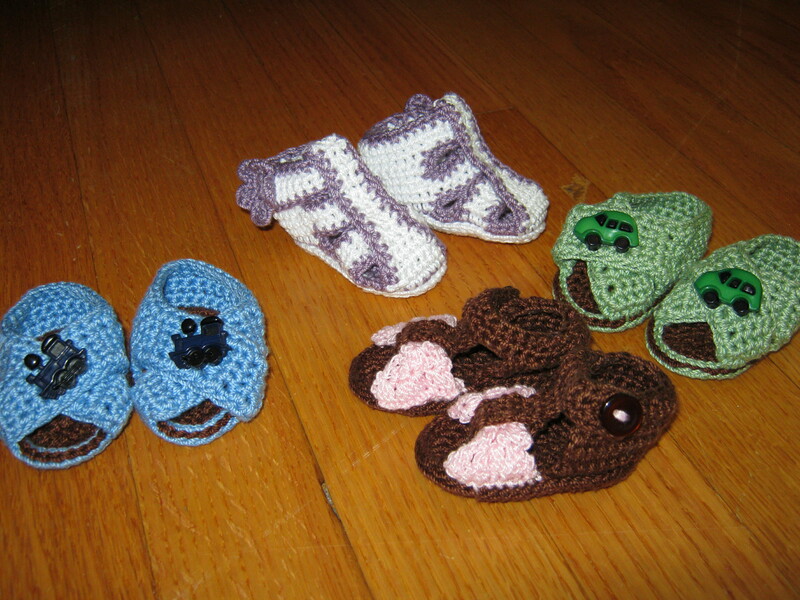 The shoes were crocheted by my friend Tina. She really ought to set up an Etsy store! My word! So cute! Here’s a close up of the little embellishments that each shoe has! The blankets were made by a very sweet young lady who I haven’t had the pleasure of meeting yet. Vivian is 10 years old and heard about our blog through Judy. She saved her money, bought the material, and made the blankets herself. So beautiful and thoughtful! The babies love them! Could we be identical twins?? We brought the boys home, put them next to each other, and realized that they look a lot alike. Whoa. 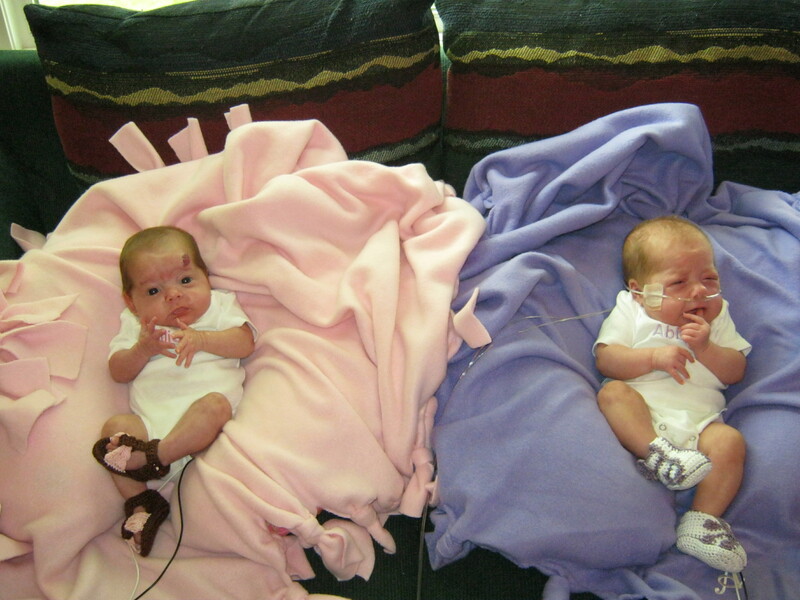 So much so that when a couple of their NICU nurses who took care of them since they were born stopped by to visit them last week, they got them mixed up! I even have a hard time telling them apart sometimes. Sean and I finally decided that some painted toenails were in order. Each of the boys now have their big toenails colored to help us keep them straight. I think we will probably give them a few years, but if they still look alike, we will probably have the twin test done to see if they are identicals. Apparently, even though they each had their own sacs in utero, they could still be identicals if the egg split early enough. Who knew! Pretty sure they've grown a bunch in less than a week! Cuties! See you all Monday! so very precious!!! thank you for taking the time to keep us imformed!! I love getting to see your babies!!! Oh, thank you for sharing! They look so beautiful and happy and healthy! Praying for your strength and stamina, and everyones continued health. absolutely beautiful, how they have grown!! They are just beautiful, and you do sound good. Praying for you. Thanks for the note. WOW! Looks like they love being home and are growing big, strong and healthy. Great job, Rebecca and Sean...you are parenting quadruply well! The babies look SOOO amazing, Rebecca and Sean!!! I'm just dying to snuggle them! Sounds like you are really getting their schedule down and being wise in using the little bits of quiet time you get! KEEP TAKING THOSE NAPS!! They will save your sanity!! Please smooch those little bundles for me! I love you guys this is amazing. The babies have grown so much. They look so cute! It sounds like you guys are doing great! That makes me very happy!!! The kids look awesome!!! Hugs to all of you! What a sweet bunch of kiddos!! Seeing the pictures brought tears to my eyes. They are all so very precious! Thanks for sharing! We used to tell our twin boys apart by the top curve of their right ears. One was rounded, the other had more of a straight line. We also did the color thing, red for one, blue or green for the other. To this day we don't know if they are identical or not, they too had separate sacs, but even some relatives can't always tell them apart. How fun. Relax and enjoy these memorable days! I haven't posted before but have been praying for you since your mom sent me the link to this blog. I have to admit - I did take some of the pics to print off for my cube - got to put up all my nieces & nephews :) They are just too cute! OMG, they definitely look like twins. How flipping cute they all are! It's hard to believe how much they've grown. How handsome and beautiful they are!! Thanks for taking the pics to let us all see and taking the time to fill us in on their progress. I'll bet it's a real challenge taking them all to the doctor's office. Continuing to pray for you ALL! God bless.